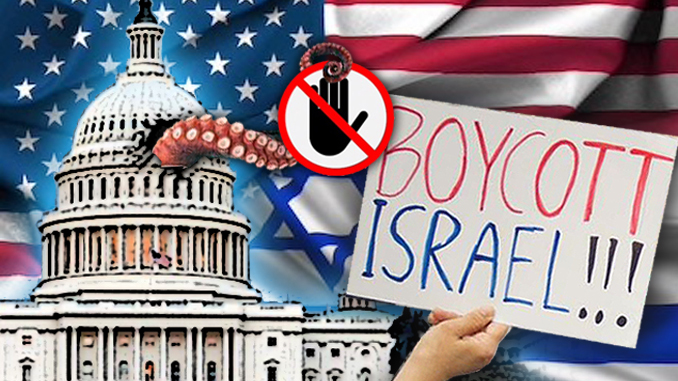 You are here: Home » American Voice » Will Congress Ban Boycotts of Israel? On Dec. 6, the House of Representatives passed a continuing resolution appropriations bill that will keep the government funded until Dec. 20. By that date it is anticipated that an omnibus end-of-year bill extending that spending authority for 2019 will be completed, assuming that a deal on funding President Donald Trump’s border wall can be worked out. No one would be surprised if the final appropriations package that comes out of the process will be ill-considered and full of pork for individual congressmen and districts. One trick used to pass legislation that would otherwise fail is to attach a bill anonymously (no name and no number) to the spending bill, which must be passed in one form or another if the government is to continue to function. One such attachment that has currently and somewhat mysteriously appeared is reportedly entitled “Consideration of Legislation Making Further Appropriations for 2019.” Bills attached in that fashion will become law without debate or being subjected to any challenge from opponents. There are a number of bills in Congress relating to Israeli interests, most focused to some extent on undermining the nonviolent Boycott, Divestment and Sanctions (BDS) movement. For the friends of Israel in Congress it is urgent that the bills pass before the end of the year, because if they do not, they will have to begin the legislative process in committee over again in 2019. Israel and its ardent supporters in the media, in lobbies, and in Congress are engaged in a determined push to make BDS illegal in both the U.S. and Europe because they feel threatened by its success, particularly among young people. The most contentious measure currently being promoted is the Israel Anti-Boycott Act (IABA), introduced in the Senate by Sen. Ben Cardin (D-Md. ), which many observers fear will be attached to the impending spending legislation. Cardin and his fellow Democratic senator Chuck Schumer (N.Y.) are the most prominent Israel-firsters in the Senate. In their view, nothing is either too good or too much to give to the Jewish state, while Israel can do no wrong, even when it steals other people’s land while also setting up unarmed demonstrators and medical staff for target practice. The possible federal legislation would far exceed what is happening at the state level, where 25 governments have passed laws punishing citizens who advocate boycotts of Israel. In Texas and Missouri, citizens have had to sign documents confirming that they would not boycott Israel before receiving disaster assistance or obtaining a state job. IABA would undoubtedly set a new standard for deference to Israeli interests on the part of the national government. The act would criminalize any U.S. citizen “engaged in interstate or foreign commerce” who supports a boycott of Israel or who even goes about “requesting the furnishing of information” regarding it, with penalties enforced through amendments of two existing laws, the Export Administration Act of 1979 and the Export-Import Act of 1945. The laws include potential fines of between $250,000 and $1 million and up to 20 years in prison, though it is reported that the prison penalty has been removed from the IABA draft in response to objections from civil libertarians. One bill relates to the immediate appointment of a new special envoy to monitor and combat anti-Semitism, a unique and uniquely hypocritical position that has been vacant since January 2017. The special envoy would be responsible for enforcing the Combating European Anti-Semitism Act, which was passed in 2017 unanimously, as well as having input on the definition of anti-Semitism in the pending domestic Anti-Semitism Awareness Act. That definition will include criticism of Israel as anti-Semitism. Other pending bills condemn Hamas for using human shields against Israel, presumably making the group responsible for the deaths of at least 214 Gazans and the wounding of 10,000 more, all targeted by Israeli army snipers and special ops teams. There is also the delay in the approval of the 10-year $38 billion guaranteed aid package for Israel, which Sen. Rand Paul (R-Ky.) is currently blocking. Paul, characteristically, is demonstrating what political waffling is all about. A long-time critic of foreign aid in general, he claims that he wants to take away money from countries that criticize the United States to free it up to give to Israel. The power of Jewish and Israeli advocates to make what is normally legal illegal cannot be overstated. Recently, professor Marc Lamont Hill was fired by CNN after speaking in support of Palestinian statehood. Critics claimed they were not denying his right to speak but that his comments constituted “hate speech,” yet another mechanism used to dismiss any and all criticism of Israel or the behavior of Jewish groups as anti-Semitism, which is presumably now a criminal offense. Though Hill did nothing wrong, quite the contrary, he apparently recognized force majeure and quickly issued a groveling apology. The record is clear on what is important to those we have elected to high office. How exactly is it that pandering to something like 2% of the population of the United States has become an obsession in the White House, in Congress, and also, one might add, in the media? Would any other country in the world be passing legislation to protect a racist foreign country that has been with impunity interfering in American elections, robbing the U.S. Treasury and committing what nearly everyone believes to be war crimes? Senators like Cardin and Schumer should be impeached due to their primary allegiance to a foreign power. That these people are agents of an alien government should be exposed far and wide in the media, but, alas, the media is in collusion with them. Some American voters thought they were taking steps to drain the swamp back in 2016, but, under the current regime, the swamp appears to have grown larger and is now all around us.